This 33-unit apartment building is notable for its siting and its extraordinary use of terra cotta, among the most elaborate in the city. It is located at the edge of the hill on the west side of West Highland Drive, making it very visible from the south. The Narada was designed in 1925 by Charles A. Haynes for the Western Lime Company. Haynes practiced architecture in Seattle and Aberdeen, with various partners, from 1907 until 1940. He designed many residences, apartment houses and commercial buildings in both cities. One of the best known local examples of his work is the former Butterworth Mortuary on Pine Street. The 1920s was a period of tremendous development in Seattle. The city's population has increased dramatically in previous decades, and prosperity encouraged developers to meet the pent-up demand for housing. 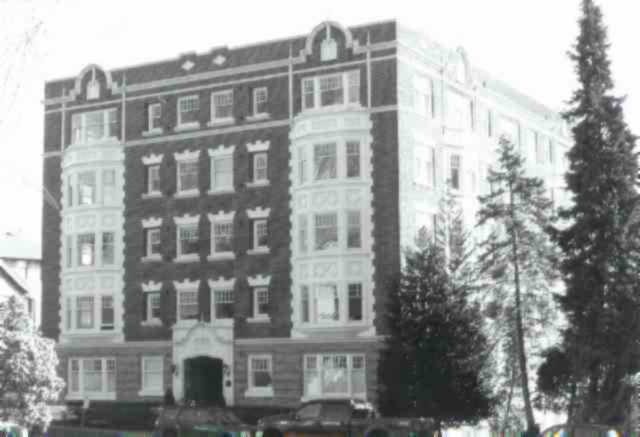 Apartments, ranging from basic housing to luxury units, were a significant factor in meeting this need, and became a significant element of the streetscape in many Seattle neighborhoods. The Narada is a fine example of the design attention paid to many of these buildings, where detailing and materials were used to reduce the impact of large structures. The Narada's most striking features are the two projecting window bays, extending from the second to the fourth floors on the main (north) façade. They are clad entirely in terra cotta, with geometric motifs. Cladding is red brick, with lighter shades on the first floor. The center windows are ten-over-one double-hung sash, flanked by six-over-one sash. The four windows between the bays are similar, with terra cotta sills and prominent segmented lintels. Windows on the first and fifth (top) floors are simpler, with terra cotta sills only. Terra cotta belt courses are located at the top of the first, fourth and fifth floors. A wider course in the middle of the parapet arches above the two prominent end bays, with a shield medallion in the center of each arch. Similar window arrangements, with elaborate terra cotta-clad bays, are found on the west and south elevations. The main entry has a wrought iron gate and is recessed under an elaborate terra cotta Tudor arch with twisted ornament and a shield design matching those on the parapet. The basement level is clad with stucco, and is visible for some distance down the hillside; there is a side entry on the west.